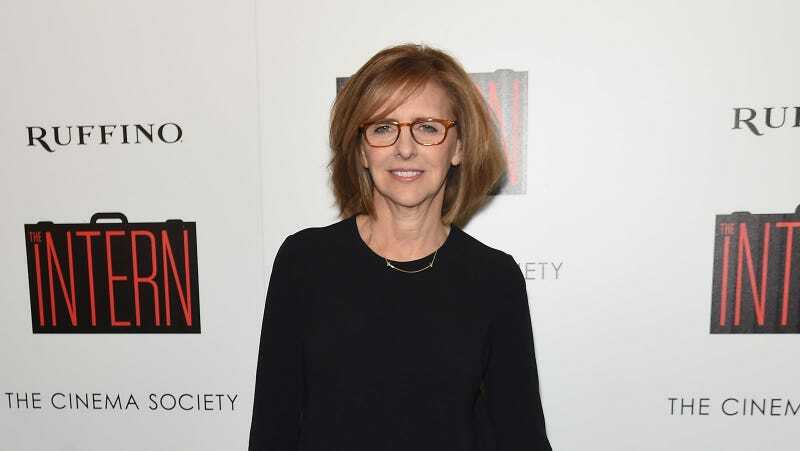 Nancy Meyers, the writer/director who gave us unforgettable comedies like Private Benjamin, Baby Boom, and Something’s Gotta Give in addition to beautiful kitchens like Diane Keaton’s warm traditional in Father of the Bride, Dennis Quaid’s bright, open concept in The Parent Trap, and Meryl Streep’s under-ovened in It’s Complicated, was nearly killed by her own passion Wednesday afternoon, according to a post on her Instagram account. “I was so interested in the kitchen on the side of this truck I almost got into an accident,” Meyers captioned a photo of a Snyder Diamond vehicle, which she appears to have photographed while her car was stopped. The sleek kitchen that nearly killed her is a large, white and stainless steel contemporary thing, with two ovens, a massive island, and professional hooded range. It’s the sort of kitchen that, oh, a Reese Witherspoon-type would have in the enormous TriBeCa loft that she shares with her famous actor husband (a Liev Schreiber-type) who dumps her for someone younger (a Jennifer Lawrence-type) leaving her out on her own (and without a beautiful kitchen) for the first time in her life. Maybe she starts a business (perhaps related to interior design) or maybe she gets back into acting (she put it on the back burner after her ex won his first Oscar)—the point is, she eventually becomes a success and gets a place of her own (and a kitchen she loves) back by the end of Act III. It’s not nearly as extravagant as the one she shared with her ex, but—while watching her entertain friends with small dishes, wine, and cookies—we realize the size of a kitchen isn’t important. What’s important is filling it with people you love—and love to feed. Like your closest friends and new boyfriend, perhaps played by Aaron Taylor-Johnson because get it, girl! What a movie that would be.